Data is from the February 2016 DemandWave (formerly WebMarketing123) report titled "2016 State of B2B Digital Marketing." 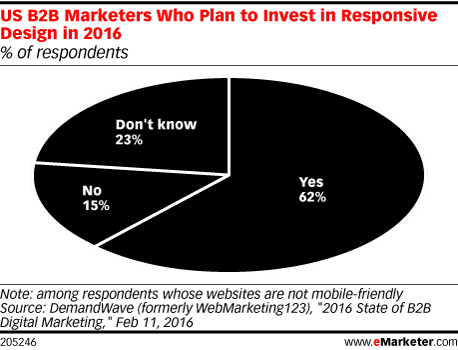 284 US B2B marketers from a variety of industries were surveyed online in November 2015. Respondents identified their job level as director (38%), manager (34%), VP (13%), individual contributor (11%) and C-level (5%). Respondents identified the number of employees at their company as between 1-10 (7%), between 11-50 (24%), between 51-200 (22%), between 201-500 (12%), between 501-1,000 (12%), between 1,001-5,000 (11%), between 5,000-10,000 (5%) and 10,000+ (8%). DemandWave is a B2B digital marketing agency.